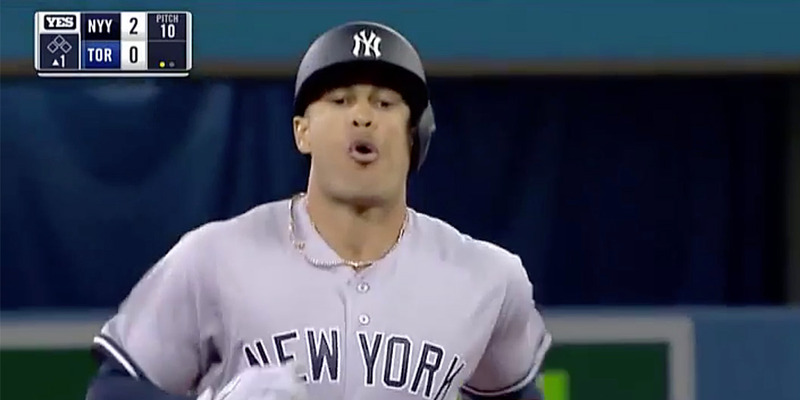 Giancarlo Stanton hit a home run in his first at-bat with the New York Yankees on Thursday. Stanton came over the Yankees from the Miami Marlins in a December trade and adds another big bat to a stacked Yankees lineup. In a sign of things to come, New York Yankees newly acquired slugger Giancarlo Stanton smacked a home run in his first at-bat on Thursday. Stanton, who came over to the Yankees from the Miami Marlins in a December trade, led MLB in home runs last year and adds a scary dynamic to an already-powerful Yankees lineup. Batting third in the lineup, Stanton got a hold of a fastball from Toronto Blue Jays pitcher J.A. Happ on the second pitch, and sent it deep into center. With a combination of Stanton, Aaron Judge, and Gary Sanchez, the Yankees figure to score a lot of runs this season. Stanton already got the party started.